Sarangerel and I met in the spring of 1999 in Athens, Ohio over a cold beer. She was in town to lead a weekend intensive hosted by my first teachers in earth spirituality, Bekki and Crow of the Church of Earth Healing. 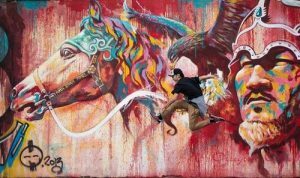 Of mixed Mongolian and European ancestry, Sarangerel was in the United States after spending most of the previous decade living in Russia and Mongolia training in the traditional ways of her Buryat Mongol ancestors. Her workshop provided my first experience with a shaman steeped in traditional indigenous culture, and the seeds planted that weekend continue to bear fruit in my life today. Upon waking, I knew that I to needed contact her and relay the offer of support. She eventually replied and invited me to meet at her home near Detroit. During this late 2003 visit, she shared in greater depth of her tradition, and we made plans for her to come to California to offer earth healing ceremony, shamanic training, and personal healing sessions. In the next two years I hosted Sarangerel to teach and offer healings in the S.F. Bay Area and through her dedication to the spirits and to the Earth she touched the lives of many people. During these visits she stayed in my home, and we developed a strong, positive connection. I was deeply touched by her dedication to her people’s traditions, her reverence for the spirits and ancestors, and her kindness, especially toward those judged or marginalized by mainstream society. I also began to dream regularly of her, receiving useful and unexpected teachings. The last time Sarangerel stayed with me, she left two reminders of her presence in my apartment. First, in my freezer she left several bottles of arshaan, empowered liquid (in this case vodka), that she had blessed for use in ceremony. She also shared stories during that visit of traditional Mongolians who kept a batch of arshaan going for generations by adding a small amount of the already blessed liquid to a new container. Second, right before leaving, she turned to me, placed a pair of pants in my closet, and said, “It’s customary for a shaman to leave an article of clothing in a place where they plan to return”. At the time I did not make much of either the arshaan or Sarangerel’s plan to return as evidenced by her pants in my closet. In late February of 2006 Sarangerel and I enjoyed a great conversation that renewed our enthusiasm to work together. We made plans for her to return for a third cycle of training and healings over Summer Solstice. A week later, Sarangerel’s husband called to tell me in his heavy Mongolian accent that she had died, and could I please let people know. Although Sarangerel had been in and out of the hospital in years prior for health complications, her death was a complete shock to all of us. The doctor’s explanation was some combination of acute infection and systemic failure. As I told Sarangerel’s circle of friends and relatives of her passing, I personally wrestled with a whole range of feelings and reactions. I struggled with feeling dropped; that I followed her back into the collapsing building and she suddenly left me there alone and without her protection. In the years before her death, I went through painful betrayals and disappointments with two different spiritual teachers, and those experiences fed the temptation to see her death as another example of me being abandoned or thwarted by Spirit. 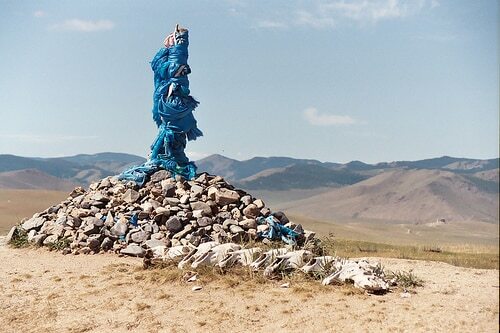 I felt confused and discouraged, and I struggled to stay open to the pain of her passing rather than withdraw.In the midst of my grief, I was also aware of her work, her legacy as Mongolian shaman and teacher, and how much would go unfinished without her. 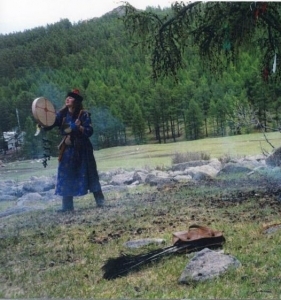 She had a book planned on the Mongolian goddesses and the sacred feminine in Buryat shamanism. Suddenly this vision had become more marble and concrete falling through the ceiling. 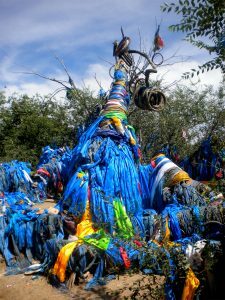 Although I have gratefully carried on a handful of practices Sarangerel taught me such as the “Peace Tree” ceremony, I never imagined myself in her role as one who could be responsible for preserving and renewing Mongolian shamanic traditions. I knew that I was not the only one in the building; there are many others who loved her deeply. Undoubtedly some Mongolian goddesses and other traditional spirits have also felt the loss of one of their children on Earth. Despite all this and even if I knew at the time of the first dream what I do now, I would still reach out to her. I would still follow her back in. In the five years since Sarangerel passed, gradually I have come to know her in her new form as an important ancestral guide and ally. In addition to occasional meetings with her in the dreamtime, I call upon her support as a beloved ancestor when leading earth healing ceremonies and some of the shamanic healing sessions. As a fierce warrior spirit and good-humored, two-spirited healer, when I sense her to be present, I know my back is covered. These moments of intuitive connection with Sarangerel are supported and reinforced through tangible, physical practices like renewing and setting out the arshaan she blessed while alive and engaging in focused dialogue through divination at my ancestor shrine. Of course, this new type of relationship does not negate the sadness and loss I have felt at her passing. 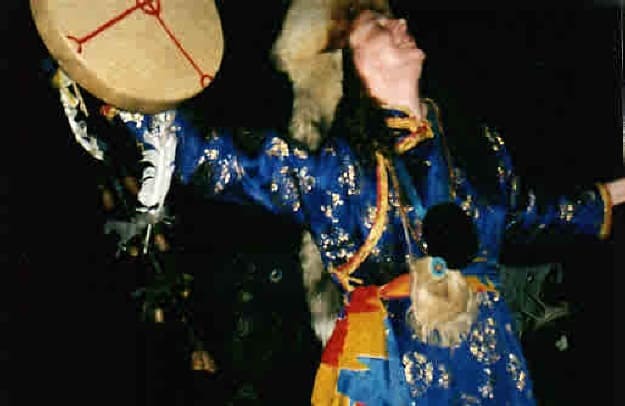 In Fall 2008, I attended a shamanism conference in San Rafael. As I listened to visiting Mongolian shamans that Sarangerel knew personally speak about their tradition, I became intensely aware that Sarangerel wanted to be physically present. Afterwards, I approached one of the presenters, Batbayar Gonchigdorj, realizing that Sarangerel had given me his name several years prior as someone I should contact. 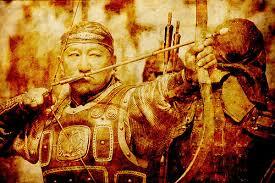 Feeling her spirit with me, I began to talk to Batbayar about Sarangerel, tearing streaming down my face. The children’s song arose in my heart and mind, “Ashes, ashes, we all fall down.” Had I spoken Mongolian, I wouldn’t have been surprised if she had wanted to step into my body to converse directly with Batbayar. Instead, the song felt like her way of conveying a little of how much she missed being alive and being able to talk with her Mongolian shaman friends and also a way for Spirit and the spirits to remind me how sooner or later “we all fall down”. Sarangerel taught me so much about how to relate with the ancestors. She was supportive of the genealogical research and shamanic ancestor work I have done with my biological family and lineages. She shared that her two main shamanic guides were lineage ancestors from different sides of her family. Through our conversations, her books, and the trainings, I found confirmation and renewed inspiration for my efforts to uncover and restore the positive medicines along my blood ancestral lineages. Through ceremonies like the Peace Tree, she shared powerful practices for engaging the ancestors of the land who may need assistance before they are able to serve as helpful ancestors. Each of the seven times I have led this ceremony since her passing, I have been touched by the positive response from the human participants and the spirits. Sarangerel is standing near me. She has an 80-foot long black whip that she is clearly comfortable using. There is a sense that she would like to guide me in how to use this over time. At the time I have no idea how I would even really begin. For me this dream speaks to my own process of gradually coming into a sense of personal authority and confidence with ceremonial work. 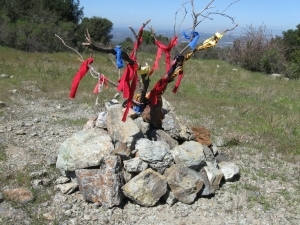 On the three-year anniversary of Sarangerel’s passing, February 28th, 2009, I led a group in the establishment of a natural Mongolian-style stone-pile altar (ovoo) that included prayers for earth healing at the site of the former Almaden mercury mines near San Jose. I arranged for this ceremony months before I realized it was the anniversary of Sarangerel’s passing. During ceremony I sensed her strong support and even pride at the work we did that day. Two months later, in a nearby area of the mountains, at the end of a day of ceremony I was cleaning garbage from a steep canyon by dragging out a long, flexible piece of black pipe or tubing. In the instant when I picked up the pipe, the dream of the whip flooded my awareness, collapsing for a precious instant any sense of distance between Sarangerel and I. To use an expression from Buryat Mongol tradition that speaks to the time of intention and manifestation becoming one, “Hoyor sagai negende!” or “Two times becoming one!” As I have attempted to give words here to my journey with Sarangerel, I am left with the impression that my growing faith in traditional ways of relating with the spirits is now the force preventing the building from collapsing, that in one sense I am now someone who is being called to hold up the ceiling in my own life and in service to Earth and community. In one reading of my journey with Sarangerel, our relationship has collapsed; Sarangerel is dead. And yet in another, I am still following her back into the building. In this same moment of turning to follow her, amidst the rubble I am picking up the mantle of earth ceremony and the 80-foot shaman whip. By saying yes to the spirits, I am saying yes to the vision of empowerment and initiation that Sarangerel has held for me. And under the increasingly sturdy roof and shelter provided by these older ways of knowing, I am grateful for the fruits that continue to manifest from my relationship with Sarangerel as a beloved ancestor.